As a special after Christmas gift I received a small envelope in the mail today and was surprised to find the second set of Holiday nickels from California. These pressed coins became available just a short while ago in the Disney California Adventure park, and the machine can be found in the Los Feliz Five & Dime on Buena Vista Street. 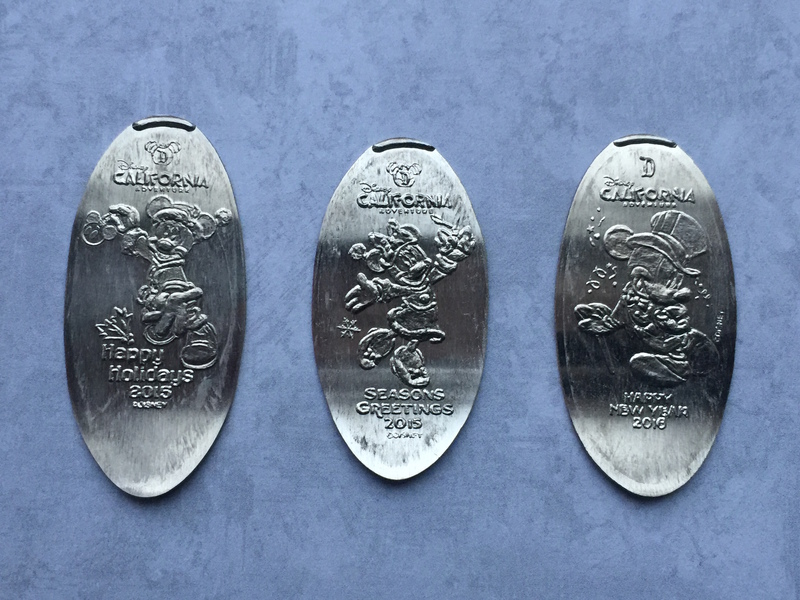 The designs on these nickels include Mickey wishing everyone a Happy Holiday’s 2015, Minnie saying Season’s Greetings, and Mickey with a top happy New Years 2016. This should complete the holiday nickel sets for this year, unless Disney decides to surprise us with another machine which is potentially possible. But if the last few years are any indication this should be it, just one machine (3 designs) for each of the California parks. Now I just have the painstaking task of waiting another 365 days before I can try to get next years coins. But I’m sure I’ll find a lot of other coins between now and then which should keep me busy. Happy Holidays! !